This Iron Craft challenge was to use sewing notions in a project. I found these cute polka dot buttons for something like $1 a package and knew I had to do something with them. I’m one of those people who is cold most of the time so cardigans are a mainstay in my wardrobe spring through fall (then I pull out the really warm stuff). 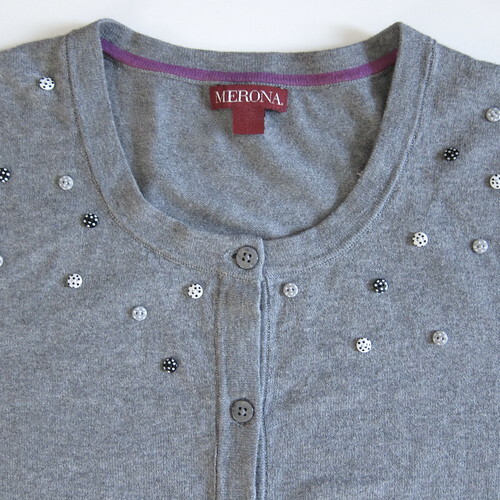 I love the look of embellished cardigans, but find you often are paying a lot extra for the embellishments. My answer is to buy plain, inexpensive cardigans at Target (which they seems to have year round) and add my own extras to them. 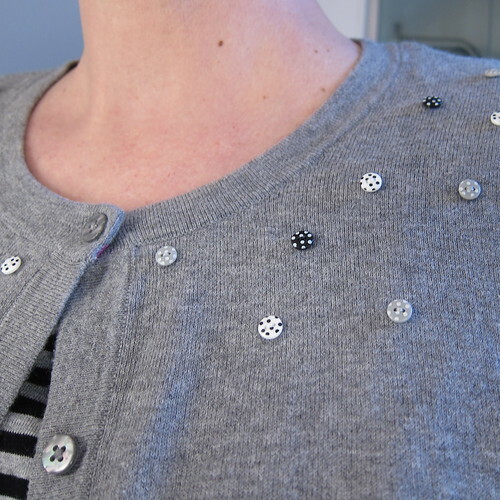 I thought these buttons would look really fun scattered around the yoke of one of these cardigans. Plus polka dots are very on trend for spring and summer this year. I love the way the buttons themselves create polka dots on the sweater and that they themselves are covered in polka dots. This project is so simple it really doesn’t require a tutorial. Basically, I just randomly sewed the buttons around the front and back of the yoke section of the sweater with matching thread. It is a little tedious sewing each button on, but I think the finished look is worth it. You could get some many different looks with buttons and a sweater based on the buttons you pick. You could keep is my subtle and use all buttons that are the same color as the sweater, a cream sweater with cream buttons could be so elegant. 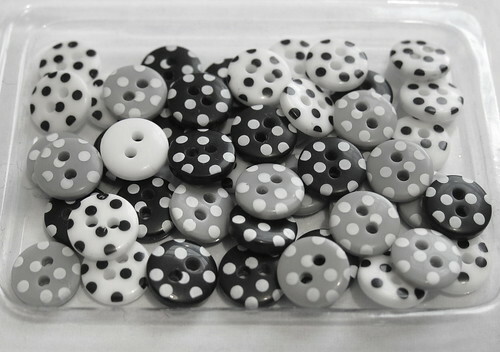 You could have fun with color by using solid color buttons and contrasting thread to sew them on. You could show off a bunch of vintage buttons for a retro look. 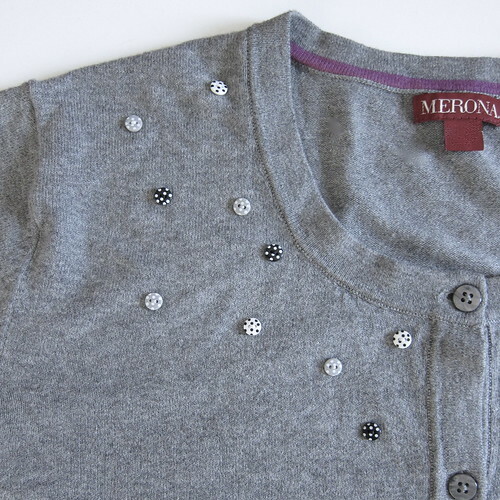 Or add some bling by using all metallic buttons. Really your imagination could take you in so many directions. 6 years ago by Kat in Challenges , Iron Craft , Needlecraft , Projects , Sewing , Sewing Projects | You can follow any responses to this entry through the RSS feed. You can leave a response, or trackback from your own site. Another great project. I thought about collecting buttons for my bookbinding but decided that I had too many collections already. Kathy,this is adorable! I never think of embellishing store bought clothing but it’s such a great idea. And how much do I love the buttons? They’re perfect with this! This idea is quite nice. 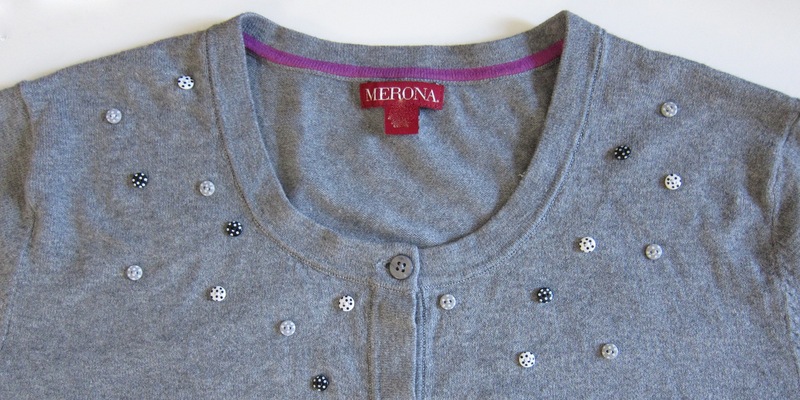 I have a very servicable gray cardigan that I may attck with buttons later!! !